Canada’s Truth and Reconciliation Commission formed to address the residential school experience of First Nations; an Alberta symposium about the commission ended with the question “how can society spread the message of reconciliation”? As an archaeologist, my answer started with a collection of religious medallions found in a garden in northern Alberta and ended with a story about spiritual change, the value of heritage objects, and the powerful roles that historians and archaeologists can play in portraying the past. A small, yellow box of Roman Catholic medallions from the 1800s seemed unusual company next to the stone arrowheads in my office. They popped up in a garden next to a First Nations community along Meander River in northwest Alberta. During a site visit, community members shared the collection in the hopes that I could in turn help share the story of the medallions. 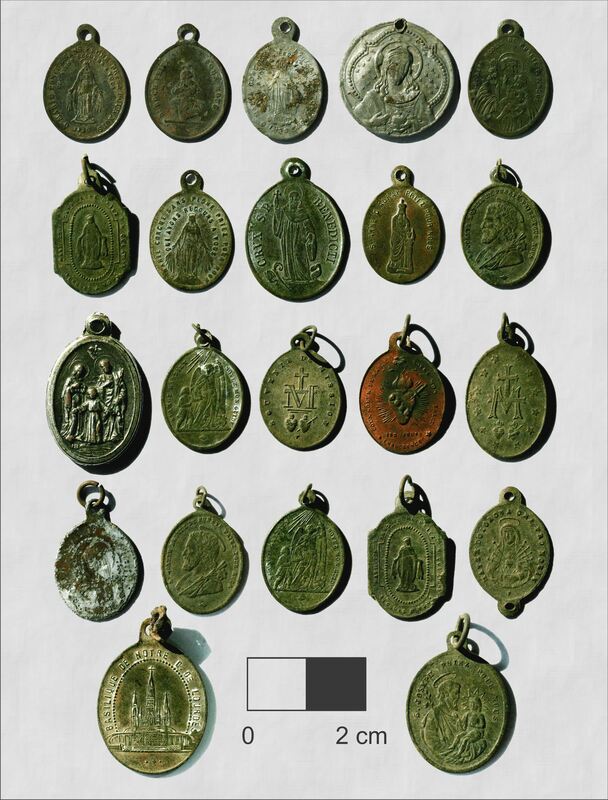 Roman Catholic medallions from the 1800s found in northwest Alberta. The medallions are symbols of a time when Christianity was spreading among First Nations communities. Most of Alberta’s Rocky Mountains finished uplifting 50 million years ago – they’ve been pouring sediment across the province ever since. The Rockies shaped our water drainage network and, with the help of glaciers, erected the house of silt, sand, and stone that we all live in. The tilt that our mountains built is largely responsible for the development of our prairie soils and modern agriculture. Our mountains have also shaped how cultures interact and move, which has moulded much of our history.